Transparency Market Research (TMR) has published a new report titled, “Hematocrit Test Devices Market - Global Industry Analysis, Size, Share, Growth, Trends, and Forecast, 2018–2026”. 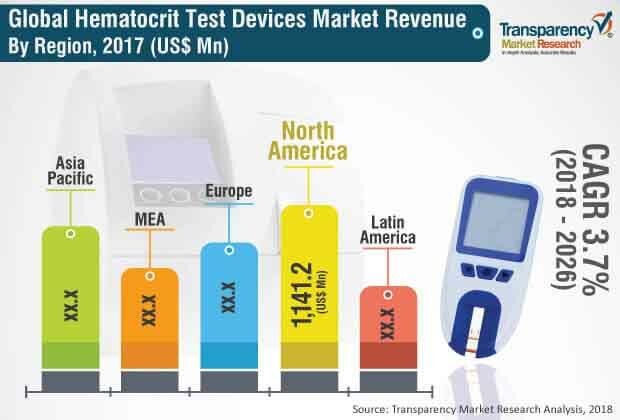 According to the report, the global hematocrit test devices market was valued at US$ 3780 Mn in 2017 and is projected to expand at a CAGR of 3.7% from 2018 to 2026. The global market is anticipated to witness relatively stable growth owing to no pipeline of hematocrit test devices and high replacement rate of hematocrit test devices. Blood borne diseases are a major threat to public health. Anemia is a common condition responsible for fluctuation of hematocrit value from normal range, predominantly found in pregnant women and children. Anemia is a condition caused by deficiency of number of red blood cells in human blood, leading to low hemoglobin level. Anemia can be induced due to any chronic health condition. Considering the increase in incidence of blood borne diseases, it is important to understand the factors influencing the severity of the diseases and the best possible treatment diagnosis options for them. Public and private players are striving to reduce the prevalence of blood borne diseases by installing hematology devices in health care settings. In the developed countries, physicians and governments have begun to educate the general population about the importance of diagnostic testing. Several agencies are providing funds to research organizations to promote the innovation of technology which can be used in the manufacture of new generation hematocrit test devices that are more effective than traditional hematocrit test devices. This is likely to augment the global hematocrit test devices market during the forecast period. North America and Europe accounted for significant shares of the global hematocrit test devices market in 2017. This is attributed to high health care expenditure, high rate of diagnosis and treatment of blood borne disease (anemia, leukemia, polycythemia, etc. ), rise in awareness about importance of hematocrit test, greater market penetration of newly developed advanced hematocrit test devices products, favorable reimbursement policies assuring business growth for new market entrants, and presence of major players in the regions. However, change in reimbursement and insurance policies for CBC test in 2017 and stringent regulatory framework for manufacturing of diagnostic devices in the U.S. are likely to hamper the growth of the hematocrit test devices market in North America in next two to three years. Asia Pacific is likely to offer significant opportunities in the hematocrit test devices market during the forecast period owing to increase in geriatric population, demand for better quality of patient care, and rise in incidence of blood borne diseases in the region. The global hematocrit test devices market is dominated by a few major players, accounting for nearly 70% share of the market. Technological advancements, evaluation of safety, efficacy, and precision of hematocrit test devices, and increased per capita income are boosting buyer power in terms of opting for advanced hematocrit test devices. These key players are projected to dominate the global market owing to strong global presence and established distribution network. The report profiles leading players such as Nihon Kohden Corporation, F. Hoffmann-La Roche Ltd., Danaher Corporation, Siemens Healthineers (Siemens AG), EKF Diagnostics Holdings plc, Sysmex Corporation, Nova Biomedical, Abbott Laboratories, HORIBA, Ltd., and Boule Diagnostics.